Yesterday, Beloved and I had a very late brunch at Nomnomnom. Actually, I should call it afterbrunch, since it was already afternoon, yet it was our first meal of the day, so I’m coining that term. Anyway, we haven’t really researched about this place beforehand, but we do know that this place served healthy food according to friends and acquaintances who had tried this place before. I was sort of expecting a vegetarian restaurant like Greens. Since it was just located at Tomas Morato, near E. Rodriguez, it really wasn’t a risky venture. We found out that it wasn’t really a vegetarian restaurant, although they do boast healthiness in their menu items. They call their food “happy”, and most of them are mostly veggies if not for some seafood and chicken choices. There’s no beef or pork, though. Some of their menu items reminded me of Gayuma ni Maria, where there is some sort of humor involved, such as Tinapasta (pasta with *tinapa*—smoked fish), Malinomnom (log pizza with smoked fish, kesong puti, red egg, and onions), and Nuggets Mo? (a veggiemeat nuggets rice meal). We didn’t really go for the humorous choices, since majority of their menu were pretty normal, or not as humorous. We ordered their Shrooms (110 Php), Prom Pasta (160 Php), and Smoked Salmon Pizza (310 Php), which felt varied and filling enough. We also got a pitcher of their Flavored Iced Tea (130 Php), which honestly, although tasted different, was a bit too sweet for me and Beloved. Being mushroom lovers, both Beloved and I enjoyed our Shrooms. 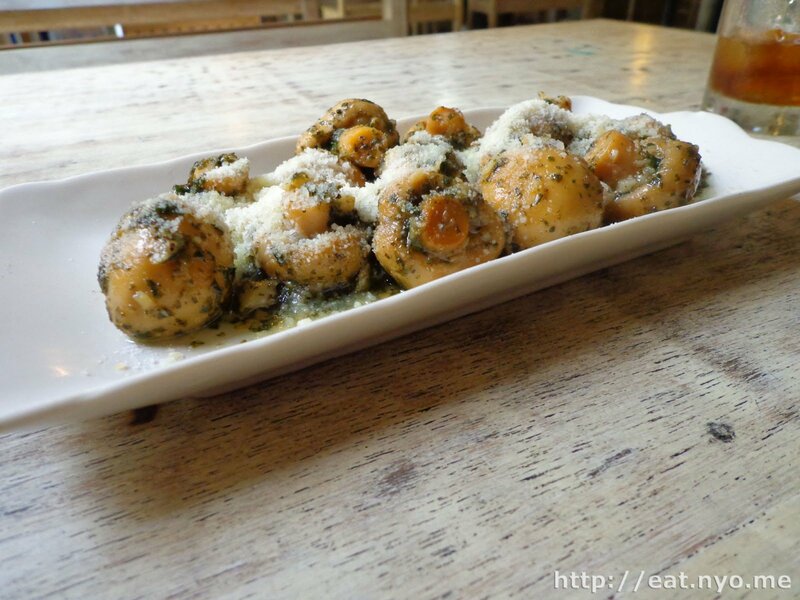 This is your usual garlic mushroom appetizer you find in most bars, except this one features quite sizable button mushrooms and pesto sauce and grated Parmesan. I could’ve forgone the sharp cheese to enjoy the flavorful pesto sauce which I enjoyed much more with the mushrooms. 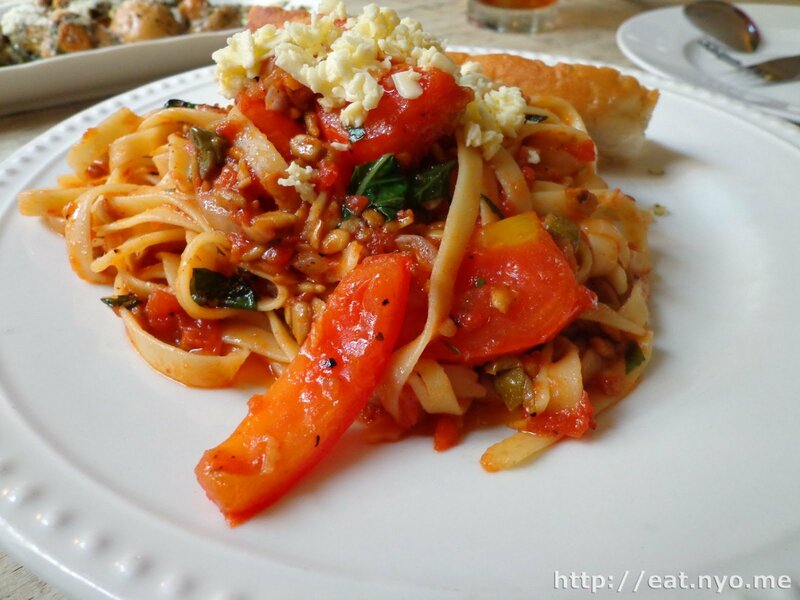 Their Prom Pasta sounded a bit like puttanesca in their menu description, especially with fresh tomatoes, basil, and capers. The twist is the nuts and creamy kesong puti crumbled on top. Even a non-pasta lover like me enjoyed this one. The one observation I noticed was the pasta was a bit undercooked, making ever so slightly hard and chewy. Luckily, I actually prefer my noodles like this over soggy, even over al dente. I cannot vouch for “real” pasta lovers, though. Their pizza, which all comes in logs, was quite an unusual approach. It was more like a long, flat bread with toppings. Our Smoked Salmon Pizza was devoid of pizza sauce. 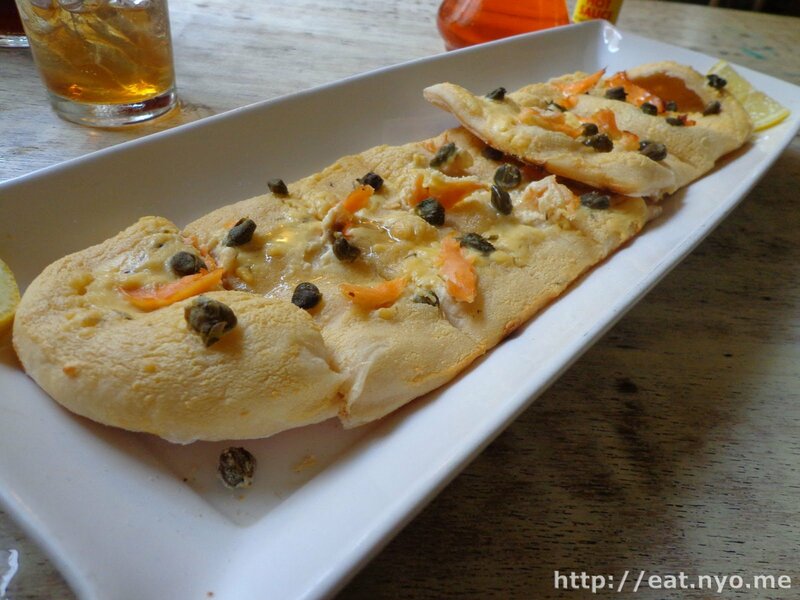 It only had three ingredients: capers, cheese, and smoked salmon. While we prefer our salmon raw, Beloved and I enjoyed this dish a lot. The smoked salmon had a smoky-salty flavor that actually went well with the pizza-slash-bread. The bread had two layers: a soft, chewy top, and a crisp bottom, making it quite a nice substitute to your usual mono-textured pizza crust. The cheese and capers added some change in flavor, but the real star here was the salmon and crust. All in all, we were happy. Actually, I was still a bit hungry and was considering ordering their Fried Ravioli, but Beloved was already full. I guess my only complaint is that it is not really as affordable as I would’ve liked. No, it’s not as expensive as I would’ve disliked either. Let’s just say it barely missed my “great value” threshold by a hair. But the food was very good: not perfect, as their pasta was a bit undercooked and the amount of Parmesan cheese overwhelmed some of the mushrooms. Still, Nomnomnom promised happy food, and we left with happy stomachs. Location: Tomas Morato, near E. Rodriguez, beside the Shell gas station. Budget: ~200-400 Php per head. Recommended for: Healthy food lovers. Not recommended for: Meat lovers. Smart nomnomnom tip: The reddish oil served with the pizza is a bit on the hot side.